Iguanas require a temperature- and humidity-controlled enclosure in order to stay healthy. Commonly kept as house pets, green iguanas are large, tree-climbing lizards native to the Caribbean and Central and South America. They also are found in the wild as feral populations in Florida, Hawaii, Texas and the U.S. Virgin Islands. When kept under the proper environmental conditions and fed appropriately, these reptiles can make great pets. Especially for families with older, perhaps even teenaged, children who can be taught to handle the reptiles appropriately, or for individuals who want a long-lived companion. What should you know if you are considering an iguana as a pet? Here are 10 fun facts about iguanas. 1. They’re long-bodied and long-lived lizards. Iguanas are very large lizards that can live 20 or more years in captivity and can grow as long as six feet, nose to tail tip. More than half of their body length is due to their tail. Adult males can weigh up to nine pounds, with some especially large ones reaching as much as 18 pounds, while smaller females may grow up to seven pounds. So, first thing to know if you’re thinking of having an iguana is that you need to plan on having a very large tank or enclosure, in which the animal can stretch out and turn around. 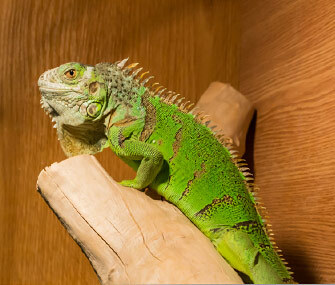 While small iguanas can be housed in aquariums, as they age, they generally outgrow the tanks and must be housed in a penned-off area or small room where the temperature, humidity and ultraviolet (UV) light exposure can be controlled. An iguana enclosure should be at least twice as long as the iguana and should be a minimum of six feet high, as they like to climb. 2. They like it hot and sticky. Iguanas like to have a basking zone that is around 90 degrees Fahrenheit and should have a cooler zone that doesn’t fall below the mid-70s. Generally, depending on the size of the tank or enclosure, a combination of ceramic bulbs that provide heat, or mercury vapor bulbs that provide both heat and UV light, are used to maintain the temperature within this ideal range. “Point and shoot” temperature guns or simple stick-on thermometers that adhere to the wall should be used. A reptile-savvy veterinarian can provide an iguana owner with advice about enclosure set up appropriate for the size of the iguana and how to anticipate future needs. Iguanas are ectotherms, meaning their body temperatures are determined by their environmental temperatures. When their surrounding temperatures drop too low, their body temperatures drop, their immune systems don’t function optimally and their metabolisms slow, making them more susceptible to infection. They also need adequate humidity (a minimum of 60 to 70 percent) to stay hydrated, as they absorb water through their skin. While all iguanas should be provided with a shallow water dish from which to drink, they also should be misted or soaked in a shallow pan of water several times a week, especially in dry climates, to help ensure they don’t get dehydrated. Like many other reptiles, iguanas need UV light to make vitamin D in their skin, which then enables them to absorb calcium from their food. The UV light cannot be filtered by glass, such as through a window, but must shine directly onto the animal. Indoor UV bulbs should be changed every six months, as the UV spectrum burns out, even though the light may still shine. Iguanas housed indoors without UV light will develop metabolic bone disease in which they extract calcium from their skeleton, leading to soft bones that fold and break under pressure. Metabolic bone disease is ultimately fatal but can be treated if diagnosed early. For this reason, all iguanas should be examined by a veterinarian when they are first obtained and at least annually after that to help ensure they are healthy.